MBBS, MD, FCCM, EDIC, EDARM, FCCP, Specialized in Critical care, Pulmonary and Sleep disorders. Practices in Indraprastha Apollo Hospitals, New Delhi. Fellowships: Fellow of Indian college of Critical care medicine (USA), Fellow of American college of chest physicians (USA). 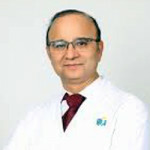 Member of National College of Chest Physicians Practicing Critical care for the last 20 years President of Indian Society of Critical Care Medicine 2010-2012 President citation award, Society of Critical Care Medicine, USA.